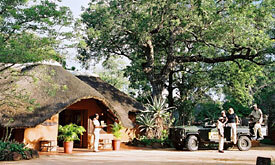 The ochre coloured buildings at Mala Mala Main Camp are clustered amid shady trees and manicured lawns overlooking the Sand River. The individually decorated, spacious and comfortable rooms under traditional thatching, enjoy spectacular views and are equipped with "his" and "hers" bathrooms, 24 hour temperature control, insect proofing, direct dial telephones, a mini-bar and a mini safe. Despite the comfort offered, MalaMala retains an authentic camp atmosphere, where the attention to detail for which Mala Mala is world famous is obvious. 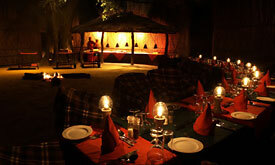 Dinner, where one may enjoy venison specialties and haute bush cuisine is served in the grand old African manner, under the stars in a reed enclosed boma, a MalaMala tradition for over 60 years. Seated around a log fire, under the starry African sky, enjoying superb food and outstanding South African wines is yet another highlight of the Mala Mala experience. The luxury and comfort of Mala Mala Main Camp, combined with the exhilarating game drives and guided walks in beautiful unspoilt wilderness dramatised by the close encounters with Africa's game, big and small, is incomparable. 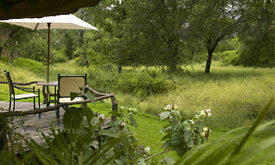 Each of the air-conditioned rooms at Mala Mala Main Camp enjoys a spectacular view of the surrounding bush and are equipped with "His" and "Hers" en-suite bathrooms, insect proof screens and top quality large twin beds. Individually decorated, they feature sets of animal or bird prints, complementing the attention to detail for which MalaMala is world famous. 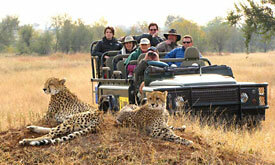 Mala Mala prides itself on being one of the few safari destinations which is able to offer a fully equipped disabled suite - designed in accordance with the Disabled People's Information Service of South Africa and is in line with international standards. 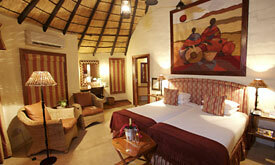 18 luxury thatched bedrooms (including suites, family rooms, a disabled suite and a single room). Separate "his" and "hers" bathrooms per bedroom. 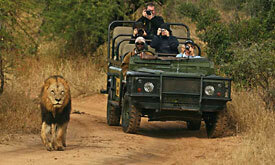 Maximum number of guests per game viewing vehicle is 6. Mala Mala Main Camp and Mala Mala Sable Camp have a permanent internet connection via Satellite at 256kbps - there is no extra charge to guests for the use of the service. 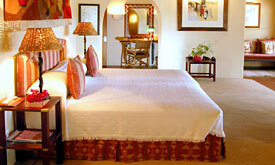 The guest rooms have an analogue dial-up jack available for those guests with lap tops with built in modems. A connection speed of 45kbps can be expected from the rooms. Complimentary bottled Mount Anderson Spring water in each bedroom. Filtered swimming pool. Facsimile and e-mail facilities available. 24 - hour electricity with standby generator. 24 - hour air-conditioning and heating. Room service. Gymnasium. Separate tour guide's accommodation. Complimentary laundry service (min. 2 nights only). Safari Bar featuring an international selection of beverages. 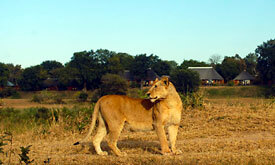 Safari Boutique. Wine Cellar. The Monkey Club - Video Den/Library. Tea and coffee making facilities in each bedroom. Overhead fans.